Beast Mode Camaro With 4000HP! Tom Bailey and his insane Beast Mode Camaro is a regular at drag week consistently doing 6 second passes, with each successive year the car gets improved upon, which is quite a feat for something that can produce 4000hp. The car is actually street legal and is driven from track to track, which some say in the comments is just down to it being registered in Florida and having a few cupholders. For a car that is meant to produce its best on the drag strip and the street, it’s quite a big ask to juggle both extremes. The video gives you a quick rundown of the car, tweaks made and then mainly showing you how it performs on the strip. It’s a unique vehicle with an insane amount of power, but the trick is getting it all down on the floor. Some say that 4000HP just too much power with most of it wasted in execution, but the flipside is if you have the resources to build something with 4000 hp, then why not? Check out the video and you decide. 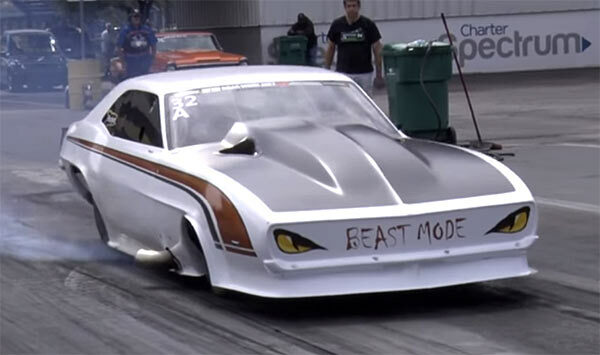 Related ItemsBeast Mode Camaro With 4000HP!